Twelve Foot Slab Fireplace Mantel ! 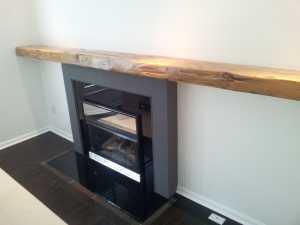 At Rebarn.ca we make a lot of fireplace mantels. All of our mantels are made with the same care and attention to detail. 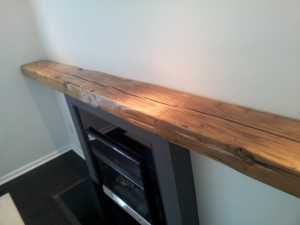 And all of our mantels are made to our client’s specifications. 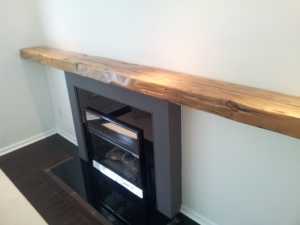 Every mantel is custom made to suit regardless of size or finish. At Rebarn.ca we choose not to prefinish our mantels. That’s because every mantel is made to order so that each customer can choose the exact beam they want to have finished for their mantel. They choose the piece…the size…the stain color and the finish. We do the rest. 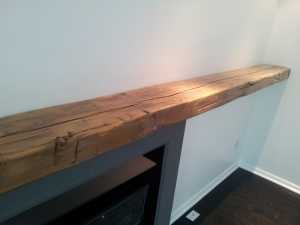 This particular mantel is 12 feet long x 10 inches wide x 4 inches thick. This is by no means a standard barn beam mantel. 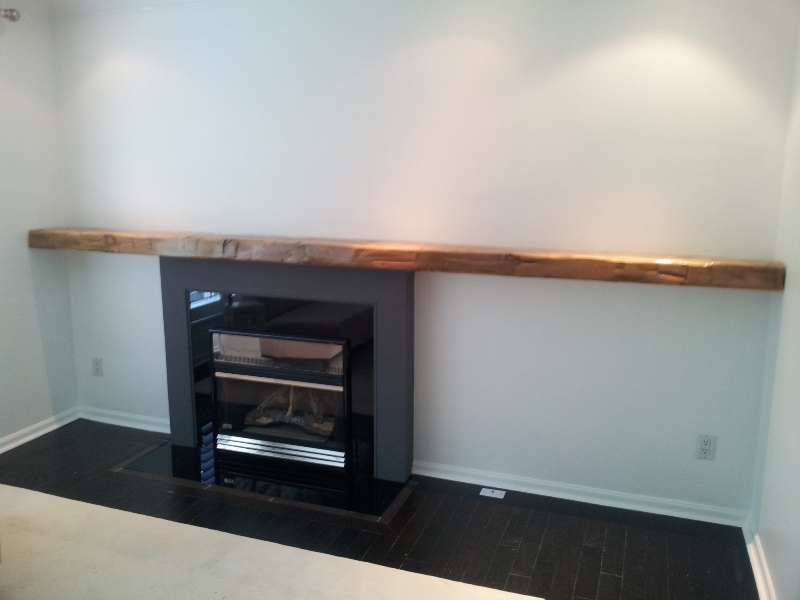 The clients, Christine and Steve, saw a picture of a “slab” mantel in a magazine that mirrored their situation of having an off center fireplace and thought they would like to duplicate the look in their West Toronto home. Apparently they sat on the idea (and the magazine clipping) for two years before making the move. Christine and Steve’s house is picture perfect. It is a 1950’s rancher that is completely – and very tastefully – renovated and decorated. The look is tight and as neat as a pin. Needless to say…I was happy to be finishing off the fireplace for them. Christine and Steve needed the 12 foot span, but wanted a thin “slab style” mantel for a contemporary vibe. 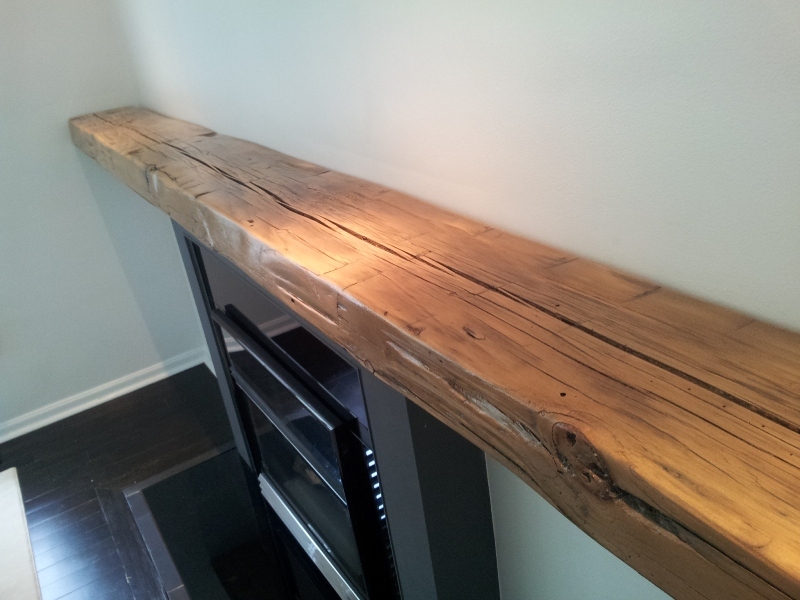 So…we took a 10×10 reclaimed barn beam and ripped it through the saw mill to yield a nice sleek slab for them. The piece was finished with a natural finish without stain. Here is the final product after installation. Once they get their accessories in place…it will look like it’s always been there. And that’s a good thing! For more information about your owns custom mantel – big or small – call Rebarn.ca @ 647-968-4004.